Good morning! It's a cold snowy day here in Maine. They're saying we could get around 14 inches today. My hubby and kids are home from school and there's no where to go so it's a perfect day to just sit around and be crafty. 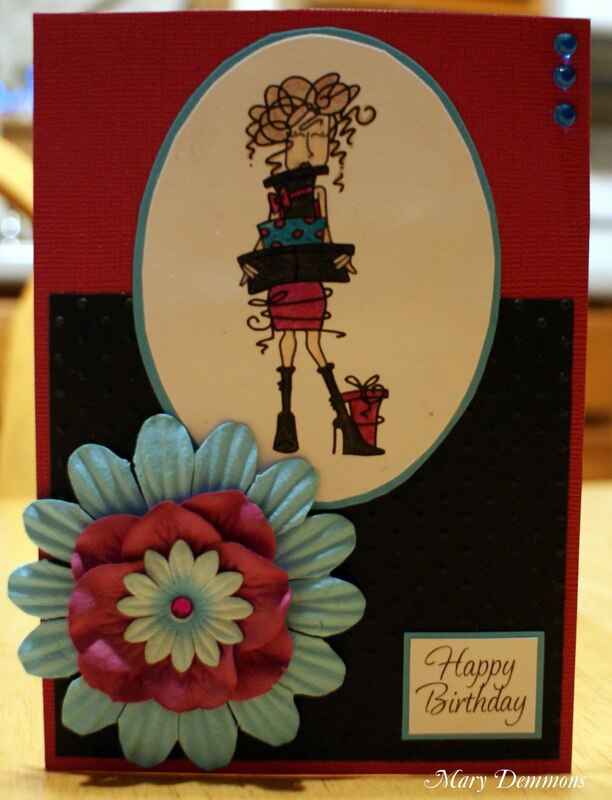 I made this birthday card using Scarlette Presents from Bugaboo Stamps. The sketch that I used is from Our Creative Corner. The challenge is to use the sketch and to play dress up with it. So I used the colors raspberry, black and turquoise. I added embossing to the black cardstock. I dressed it up with the flowers at the bottom left corner and the rhinestones at the top right corner. I colored the image using crayola and prisma colored pencils. Great card! Love the image you used to dress up this week's sketch challenge. Your flower adds that extra punch! Thanks for playing along with 'Our Creative Corner' this week! Oooh LOVE the colors you used with this image! Your card is too cute! Thanks for playing along with this week's Bugaboo Birthday Bash challenges! Mary I love your dramatic color choices on this card! Pretty flower and great job with the sketch challenge. Thanks so much for playing along with us this week at Our Creative Corner. A fabulous card. Thanks for joining our challenge at Top Tip Tuesday this week. Good Luck. Another FABO card Mary!! Thanks for joining us again this week at Penny's. Good Luck! What a fabulous job. Thank you for joining us at Stamp-N-Doodle challenges and be sure to come back and join us again. What a fun card. Perfect Sentiment. Thanks for joining our challenge this week at Top Tip Tuesday.